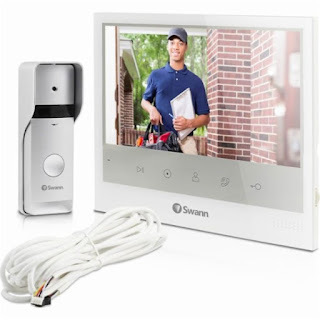 Check out this Swann - Video Doorphone $99.99 (Retail $199.99). Stay on guard at home with this Swann video intercom system. Its doorbell unit has a built-in camera for added surveillance functionality, and the 7-inch LCD display lets you see who's at the front door without stepping outside. This Swann video intercom system includes a 62-foot connection cable to support distant installations.